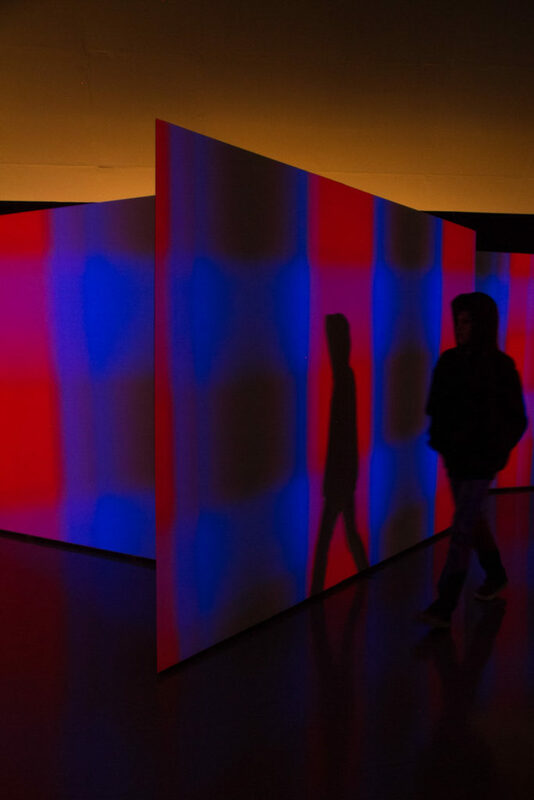 “Perspection” is an audiovisual installation exploring the perception of space through the use of projection on a series of specifically oriented projection surfaces and spatialized audio. Trompe l’oeil has been used throughout the history of image making in order to transport the viewer outside their physical location in the same way that contemporary CGI and virtual reality propose experiences outside one’s body or the virtual transportation of the viewer through technology. On the contrary, “Perspection” seeks to embed the physical experience of perception in place and create a hyperawareness of the act of perception versus a disembodiment or virtual screen space by correlating screen space with physical space. “Perspection” examines the sound-image relationships from synchronicity to independence of visual and sonic cues of perception through a series of generative audiovisual compositions. Through the use of multistable imagery and sonics the barrier between the physical and screen spaces is modulated between distinct and blurred, heightening the act of perception. Matthew Biederman works across media and milieus, architectures and systems, communities and continents since 1990. He creates works where light, space and sound reflect on the intricacies of perception. Since 2008 he is a co-founder of Arctic Perspective Initiative, dedicated to fusing traditional knowledge through new technologies towards greater autonomy of the circumpolar region and ways of knowing our world. Biederman was the recipient of the Bay Area Artist Award in Video by New Langton Arts, First Place in the Visual Arts category of Slovenia’s Break21 festival and named as one of the ‘Top 10’ exhibitions in ARTFORUM 2010. His work has been featured around the world. Pierce Warnecke is sound and video artist from the US, based in Europe for over a decade. He works equally in the aural and visual domains by creating performances, installations and compositions. His works have been commissioned by CTM Festival, Deutschland Radio Kultur, ORF Musikprotocoll and Mirage Festival. He has received supporting grants from Germany, the European Union and France (Arcadi, Dicream). After studying at Berklee College of Music he obtained his Master’s at Universität der Kunst Berlin (Kunst und Medien). He is currently a professor at Berklee College of Music’s Master’s program in Valencia, Spain. He has presented his works in many international festivals and spaces.